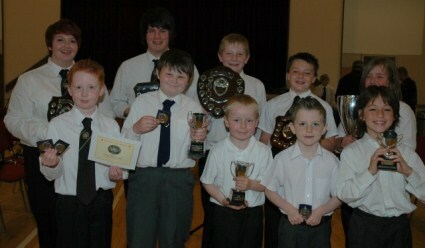 The junior and training bands held their annual concert and prize giving today in the War Memorial Hall, Carrickfergus. At 10.30am Des Graham, Principal Director of Music of the Third Carricfergus Band welcomed everyone to the concert and introduced the very smartly dressed bands to the stage with their conductor Peter Arthurs (Junior Band). To an audience consisting of the Mayor of Carrickfergus, proud parents, relatives, tutors and senior band members, the combined bands opened the very well attended concert with a rousing rendition of the "Raiders March" from the Indiana Jones series of films. As with last year's concert, it is evident that the standards are continuing to improve and that a lot of work has been done by both the players and the tutors for this to happen. This year the concert featured 3 soloists, Andrew Mitchell, Aoife Burgess and Leah Forsythe who showcased their talents with the expert piano accompaniment of Ruth Dodridge. The morning's entertainment was concluded when the junior band performed 2 well known pieces, Baggy Trousers and The Muppets, which had the audience smiling and tapping their feet. 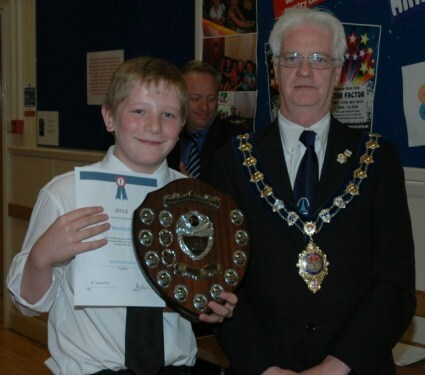 After the concert came the awards, with the prizes being given out by the band's special guest, The Mayor of Carrickfergus - Alderman Jim McClurg, whom the band would like to thank for his great support and for taking time out of his busy schedule to attend the concert. The band would also like to thank all those who attended the concert today and hope that you will continue to support the players of tomorrow. Thanks also to all who supplied and served tea and buns. Last but not least special thanks to Peter Arthurs, Des Graham and all the other tutors and helpers without whom this excellent work could not take place. Click here to see pictures of the prize winners. Congratulations to all winners, runners up and all players involved today including those players who were promoted to the junior and senior bands. The junior and training bands now go on their holidays and will start back again on Tuesday 28th August 2012 at 18:30.